Saison-Brett | Boulevard Brewing Co.
Saison-Brett, based on our very popular Tank 7, is assertively dry hopped, then bottle conditioned with various yeasts, including Brettanomyces, a wild strain that imparts a distinctive earthy quality. Though this farmhouse ale was given three months of bottle age prior to release, further cellaring will continue to enhance the “Brett” character, if that's what you're after. Probably the best Saison I have ever had. Funky Brett, crisp apple and dry as hell. Similar to Rayon Vert but a bit brighter in the flavor profile. Simply a beautiful beer that I need to find more of to put away for a year or two. Highly recommended. Loving Boulevard right now. Straight pour from a 25.4oz/750ml cork-and-cage bottle to an oversized wineglass (Jester King stemware); it looks like this was bottled on January 30, 2015, and the marking indicates it’ll be plenty good through January, 2017 (“BATCH NUMBER/BEST BY DATE: L013015-2 01-2017”). This was purchased two days ago and promptly went into the fridge, so it’s had a chance to rest at a cool temperature. Appearance (4.75): Four solid fingers of tight, custard-colored foam rise off of the pour immediately, capping a cloudy golden-orange body. As the head recedes—slowly—it leaves fat splotches of foam and thick legs all around the glass, along with a good centimeter of lumpy, fluffy foam at the surface. Smell (4.25): A mixture of light, sweet fruit and floral tones (d’anjou pear, white grapes, honeysuckle, and a little lavender), along with light, honeyed biscuits and fresh-cracked wheat flesh out the confluence of malt and yeasty esters. The brett is still pretty young, clearly, but it’s there, adding a little minerally, vinous character that plays well with the base beer’s structure. Taste (4.25): . . . and while it’s still young, for sure, there’s definitely more brett on the palate than in the nose. The dry-hopping is also clear, here, with the pithy, citrusy, little bitter tang of orange zest, which melds nicely with the vinous, mineral tones supplied by the brett. There’s a mild, tangy, phenolic funk that floats behind the vinous and zesty flavors. Some malt structure props up the hops and yeast, offering floury biscuits, and more raw wheat kernels. A little warming alcohol creeps up toward the end, along with a moderately bitter, citrus zest flavor—which isn’t all that surprising, considering this is a saison clocking in at 8.5% ABV. The brett definitely lightens up the base beer, tamping down the strongly fruity esters of Tank 7 and turning them into drier floral and lightly funky tones. The brett’s young, but this is still a damn good saison. Mouthfeel (4.5): The body comes in at a medium, velvety weight that immediately lightens up with an expansive, fluffy foaming action, which persists until it washes out. The hops and phenols, boosted by the alcohol, dry out the body significantly before the wash. In spite of its size and all of its different pieces, this is incredibly easy and satisfying to drink. It seems Brett is making a home in nearly every adventurous brewery in the US. Look back a decade ago and most brewers would not even think of letting this tasty little nasty near their tanks. This beer must get daily calls from Brussels wanting its lace back, perhaps the best lacing and head retention we've seen from an American-brewed beer. Slightly hazy, pale yellow-orange color. Smells of apple skin, musty basement, wild herbs and animal feed grain. Heavenly smoothness from a light, fluffy body. Flavors range from lemongrass to apple cider, hop oil to medicinal herbs, cracker graininess to faint black pepper. Needless to say, very complex. Alcohol drops in with that black pepper spice and some pear-like fruitiness, yet shows little warmth from its size, just more of a clean breath of alcohol. Finishes bone dry with some tart remnants. Brett & Boulevard, job well done. The massive complexities hide its strength, yet it stays dangerously quaffable. Absolutely amazing. Another under-appreciated piece of work from the astonishingly uncompromising brewery of Boulevard. Please do not overlook this beer since it is not on the top 250 anymore. Appearance: When poured into my pint glass (messed up and should have used a tulip), the first thing I noticed was the excessive, foamy head (at least 3 fingers worth). The head retention was good and it had light lacing. The body was a hazy amber. Smell: The earthy essence of the Brett is front and center; there is almost a little funk smell along with a little fruitiness. Overall, it's a nice smell. Taste: The funky Brett taste is the most noticable aspect of the taste. There is also citrus, malt, and biscut flavors. It's a complex taste that mixes sweet and sour. It's a dry beer that has little bitterness. Mouth: The medium bodied beer finishes dry and clean. The carbonation is there too. Overall: This might be the best Saison I've had. The beer is balanced in all aspects. You could grab 2 bottles, drink one now, and save one for a year or 2 and probably have the same results. Poured from a 750 corked and caged bottle into my Duvel tulip glass. I forgot to check bottle date, but this is a fresh bottle I just bought. A: A cloudy medium golden color with a nice 2-3 finger white fluffy head. Nice full long lasting lacing. S: Loads of barnyard, that brett jumps out right away. Musty with huge barnyard smells, loads of fresh fruit coupled with floral notes and some hops. Wow. T: I am surprised at how much the brett yeast really affects the flavor with such a young beer, but it does. Huge flavors of wet hay, barnyard funk and yeast but it gets mixed with the huge fruit flavors. Pineapple, sour apple, lemon and some floral flavors which are tart but some underlying sweetness is still evident. Some pepper kicks in with some hops bitterness to deliver a bone dry finish that lingers with the barnyard funkiness. This is a world class beer. M: Nice full lasting flavor provides some pricky feel with slight stickyness, but in the end it dries out nicely. Perfect carbonation, not much alcohol noted. Nice. O: I'll repeat what another BA'er said. This may be the best Saison I've ever had. I love Tank 7, but the brett in this takes it to a whole other level. I still can't believe the amount of brett that comes out with such a young beer, can you imagine if you let it age a bit? Wow, brett monster. Drink this beer, it's phenomenal. If you love brett, this is a must drink....and drink...and drink. Vintage 2014; poured 750ml bottle into Duvel tulip. A - Pretty light cloudy golden straw yellow with a sea foam white 3 finger head created on a very gentle pour. Took me about 20 minutes and 3 pours to get half of my glass full. Retention is very nice and there is plenty of thick webbed lacing..
S - A nice tart funk with yeast, grass, and some floral hops and herbs. More citrusy scents and some spice mixed in as well. Brett has really added to the aroma. T - A slight tartness along with sweetness. A nice citrus, lemon and floral hops with a wet straw/grass funk. Good amount of yeast, wheat, and some light spice to finish it off. M - Light bodied with nice carbonation. Dry and clean with an easy drinking quality. O - Enjoyed this Saison. Those who also like it should check out Jolly Pumpkin Bam Bier which is a favorite of mine. The very gentle 1st pour of the completely clear golden yellow colored beer pours out into a Duvel glass with a 2 1/2” foamy off white head that recedes slowly and leaves lots of foam and lacing clinging to the the sides of the glass. Sipping creates a few of patches and legs of lacing, which mostly cling to the sides of the glass. Even mid-way through the beer there are still large patches of foam, a thin layer and an irregular island of foam on the surface of the liquid. With the first loud “pop” of carbonation release as the cork is removed, the aromas reveal the presence of the Brett with some slightly musty and earthy character. In the background there’s some grapefruit, lemon and white pepper along with some nice floral, fruity character. The flavors are much as expected from the nose with that earthy, musty flavor up front but there’s also some tartness here. The biscuity sweetness from the malt mingles with the light touch of grapefruit, some other citrus, some white pepper and a bit of floral fruitiness. There is alcohol here but it is well concealed. The mouthfeel is on the light side of medium bodied and gently prickly with the active, persistent carbonation. The fairly long finish begins as the sweetness recedes, leaving the peppery spices which linger into earthy and crisp on the mid palate with a dry, slightly bitter ending on the back of the palate. Overall, although the Brett is clearly here and up front, it blends nicely with the underlying aromas and flavors of the base beer and so does not dominate in any way. For this beer, think of two words, complexity and balance. It’s also a beer that could be fairly refreshing on a hot summer day. That said, this is a beer for a special occasion or to make a bad day special. (If I wanted an everyday beer I’d choose the Tank 7 over this one.) Also it would be fun to have a few years of this beer to cellar for a vertical with different ages as the brett character develops and changes. "A traditional Belgian-style saison was the starting point for this limited edition ale, but then the fun began: It was dry hopped, followed by bottle conditioning with various yeasts, including Brettanomyces, a wild strain that imparts a distinctive earthy quality. Though this farmhouse ale received three months of bottle age prior to release, further cellaring will continue to enhance the "Brett" character, if that's what you're after..." Brewed in the style of a Belgian Saison / Farmhouse Ale with a Brettanomyces strain added. 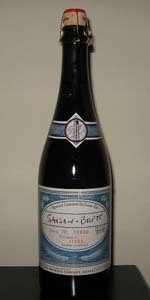 A popular annual release by Boulevard since 2007, released in 750ml. bottles and on limited draft. Poured from a 750ml. bottle to a tulip glass. Served above 51 degrees Fahrenheit. 2014 (1 Year+ Aged): Pours an equally substandial sudsy head to the 2015 vintage, slightly lighter body color, closer to straw and substantial lively carbonation (Cork shot off automatically, beware!) Retention is good, lacing is light and patchy. Aromas showcase an increase in tartness and funk, increased effervescent notes of white pepper and fruit juice. The flavor has an increase in fermented fruit juices, funk and tartness, a reduced hop profile and slightly reserved pepper and spiciness but comes off more delicately balanced with the other flavors over the fresh vintage. Texture is silky, clean, slick, carbonation is equally brisk. A phenomenal vintage, even without the boldness of the hop profile, it comes through beautifully balanced and equally flavorful. 2013 (2 Years+ Aged): This vintage pours a sudsy head, shorter lived but equally easy to agitate, a slightly hazier body with ample, lively carbonation. Retention is above average, lacing is light and patchy. The aroma of this vintage has slightly less funk and tartness than the year ahead of it, although the pepper and fruit qualities are more pronounced. The flavor profile reflects this, with ample light fruit juices, mellow tartness, light funk and shallow spicy yeast profile. Texture is slick, lightly syrupy, smooth and clean. Carbonation is equally brisk with high crispness. Another fine vintage, although the flavor doesn't quite seem to hit the same depth of the newer two batches, with noted reservations in the malt body and in the full scope of the yeast and brett profile. It seems this beer's sweet spot lies around the 1-2 year mark. Saisons are completely baffling to me. Hard for me to describe the flavor a and smells. Nonetheless, this is by far the best one that I have had. Cider and pineapple flavors stick out, with a bready aftertaste. Based on my experience with Saisons, I'm not sure if I am into the style, but this beer if definitely worth drinking. A: Milky frothy head is 0.25 inches, darker side of orange color, with a still display of carbonation. Decent film coating for a slight head. S: Slight, tart and funky dry orange aroma with a defining barnyard scent. Hay, musky yeastiness, horsehair of moderate strength. T: Flavor was lightly tart, bready malts, and funky oranges. Light horse blanket yeastiness, and barnyard scent gives this a definite wild side while maintaining drinkability. Hay, horsey-grass hopping comes on the finish with a nice lingering fade. A dry apple-pear yeastiness sneaks through in flashes. M: Crisp mouthful, tingly on the tip of the tongue, with a light to medium consistency. Light funky dry fade. O: Drinkability was good, while maintaing a sense of respectable wild side per style. The beer actually becomes easier to consume deeper into the experience. An easy A flavor, gently yet respectable, not overwhelming, with other factors of good support. If I were paying money to get a bottle of this beer, I'd probably be a bit upset, because there are better saisons at this price. Nothing to complain about, but also nothing to write home about. Typical Belgian character and slightly floral quality. Wish there was more funk or sour due to the brettanomyces. This is a wonderful beer that I have been wanting to try for awhile. It certainly lived up to my expectations. The appearance is a pretty goldenrod with a really nice haze. It poured with a really lively white head that was pillow like and creamy. The aroma is barnyard funk and straw along with a big zesty note along with some earthy notes from the yeast. The tastes are pretty similar with the zest and straw being most prominent. Has no trace of alcohol despite being 8.5%. The palate is medium plus with a great zest that really lingers. Also the earthiness really sticks to the palate Has a nice chalkiness as well. Just lasts like crazy. Probably my favorite aspect of this beer. No alcohol presence and it is super drinkable. Would think it is closer to 6.5%. Overall this is amazing and I would love to get another bottle to age for a couple of years. One of the best saisons I've had. Horse piss pour and a half a glass of head. Lemon fresh smell. Spicy lemon funk, cinnamons, coriander, saddle blanket, and leather. Did we just become best friends? Yup. A national treasure. Comparable: saison dupont (lighter and cleaner with more bubbles and less funk). Rating: Damn. I should have bought another bottle. I have had this bottled and on tap and it is better bottled. The cork releases with a pop which gets louder as the beer ages releasing herbal and spicy hop aromas mingling with cidery, yeasty fruit aromas with a little barnyard funk that gets more pronounced as the beer ages. It pours a lively, hazy straw with a fizzy quickly dissipating, fluffy head. In older versions the head is more pillowy and persistent. Bread and biscuit malt flavors support and mellow the tart, citrusy funky, earthy saison yeast flavors. Mid-palate reveals some peach. The palate finishes dry and tart with a moderate hop accent. The Brettanomyces really shows up with a very finely bubbled, soft, moussey texture that becomes more luscious and alluring as the beer ages. Hazy light gold color - a little like pineapple juice - with a substantial foamy white head that lingers a ll the way down. No real lacing, just occasional clumps of foam on the glass. The aroma is funky, floral and fruity all at the same time - hints of tropical fruit, wet blankets, crackers, hay, some vague floral notes, pine - really hard to describe and seems to change as you drink. The taste is also complex, slightly sweet and sour at once, grapefruit, pineapple, crackers, earthy, phenolic and more but nicely blended and none overpowering. Finishes nicely dry and slightly peppery. Very nice sipping brew, especially for warm weather. Medium bodied, highly carbonated, very drinkable. Overall a very enjoyable brew as it is, I'd like to try it with a year or two of age. Picked up a 2014 caged and corked 750 ml bottle from the Alpine , CA Frontier Liquor Store in early September for $14.99. Best by 2-2016. Beer poured golden with a huge saison yeast strain inspired head that is leaving lacing in a big way. Nose is musty and funky, with lemon and apple. Taste is lemon, apple, sweet tarts, with a funky dry finish. Mouthfeel is light and wonderfully refreshing for a big brew. Overall this is an excellent beer. I am not a sourhead by any stretch but I do enjoy brews with a kiss of brett. Glad I had a chance to try this! 750 ml bottle into tulip glass, bottled on 1/22/2016. Pours lightly hazy bright golden yellow color with a 2-3 finger dense and rocky white head with insane retention, that reduces to a large cap that lasts the whole glass. Dense soapy lacing clings around the glass, with plenty of streaming carbonation retaining the head. Insane appearance. Aromas of big pineapple, peach, pear, lemon zest, orange zest, apple, hay, straw, floral, grass, peppercorn, clove, wheat, bread, light honey, musty funk, light leather, and herbal/yeast earthiness. Fantastic aromas with great balance and complexity of bright citrus/tropical hops, fruity/spicy/funky yeast, and moderate pale malt notes; with great strength. Taste of big pineapple, peach, pear, lemon zest, orange zest, apple, peppercorn, clove, hay, straw, floral, grass, wheat, bread, light honey, musty funk, light leather, and herbal/yeast earthiness. Big peppery/spicy yeast and light herbal/floral hop bitterness on the finish; with lingering notes of pineapple, citrus peel, pepper, clove, wheat, bread, hay, straw, grass, musty funk, and herbal/yeast earthiness on the finish for a good bit. Fantastic complexity, robustness, and balance of bright citrus/tropical hops, fruity/spicy/funky yeast, and moderate pale malt flavors; with a great malt/spicy yeast balance, and zero cloying flavors after the finish. Very high carbonation and medium bodied; with a very smooth, crisp, dry, prickly/foamy, and lightly creamy/grainy balanced mouthfeel that is awesome. Alcohol is very well hidden with minimal warming present after the finish. Overall this is a world class Brett saison! All around amazing complexity, robustness, and balance of bright citrus/tropical hops, fruity/spicy/funky yeast, and moderate pale malt flavors; super smooth, crisp, and refreshing to drink for the ABV. An extremely delicious offering. Batch 2008-1. Summer sunshine yellow with Champagnesque carbonation that created at least eight fingers of eggshell colored foam during a gentle pour. It will be several minutes before there's more beer than foam. The head develops a gentle rockiness as it melts and is starting to grace the glass with ribbons of lovely looking lace. Second, third and fourth pours result in Matterhorn-like mountains of stiff-sticky foam that pull the score up one notch. The aroma is out of this world! Looks like combining the outstanding Boulevard Saison with Brettanomyces was a great idea. The combination of pale grains, wild grasses, lemon zest and an ideal amount of sourish horseblanket funk is so impressive that the ultimate score is an easy call. Saison-Brett is at least as good as the beer it was based on... if not a little bit better. It has been quite a while since I bought Saison and I'm hoping that it isn't really retired. If Tank 7 is its replacement, then it has some pretty big shoes to fill. Anyway, back to this beauty. Brettanomyces is wonderful stuff, but it doesn't work as well when it overpowers the rest of the ingredients. No such worries here. The tangy-earthy-funky quality of the yeast is simply one part (one very important part) of a kaleidoscopic flavor profile. Sourdough bread and lemon zest are still going strong, as is white pepper and clove on the spicy side of things. These guys must have used a Belgian ale yeast strain as well. Sweet and bitter are roughly balanced and the ABV has to be a misprint. It tastes and feels like no more than 6.5%. Drinkability is through the roof. The mouthfeel is the only (minor) chink in the armor of excellence. As was anticipated on cork extraction, the boisterousness of the beer has faded quickly. It's now on the lazy side and lacks the lightly creamy expansive quality of the best Belgians. Saison-Brett is yet another masterful creation in the Smokestack Series from BBC. It looks like this will be at least a semi-regular release, which pleases me to no end. If you have any interest in saisons or wild ales, seek this one out. 2014 Release Poured into a tulip glass. A- I had heard you should pour this beer slowly and I'm glad I did as, even with a slow pour, the glass was mostly foam. A high pillowy white 4 finger head that sticks around. The beer is a bright yellow, good degree of clarity on the initial pour. S- Big brett presence, with that earthy funk, nice lemon and grassy notes, getting even some spice and maybe just a touch of banana. T- Again lots of brett here, big basement cellar funk, maybe a slight taste of band-aid, lots of lemon notes, grassy hops, slight pepper, spice, and banana. M- Medium, not over carbed feeling despite the appearance. O- At first I found the brett aspect of this beer to be too much but as it warmed it the flavors really came together. Best by 01/2017. Picked this one up on the cheap due to expiration but wanted to try the "Brett-ier" take on it anyways. Poured into stemless wine glass. A: Finger plus of rich slightly off white head. Lots of froth and carbonation that settles into a fairly thick cap of foam. Head reaches up and clings to the glass. Beer itself is murky light orange in color. Moderate carbonation and a lot of tiny particulants floating in suspension. S: Getting a bit funky. Basement, earthy, slight horse blanket and/or straw manure mix. Underneath is a pop of citrus ala key lime and lemon. Malt peeks through in the third level. Lightly sweetened, slightly honeyed. Smells breddy good. T: Big hit of Belgian up front. Bubblegum, citrus, slight grass. Earth asserts on the mid palate along with a sizeable hit of Washington Delicious red apple. Even at a year plus, the hops pick up on the finish, with a slightly astringent note transitioning the taste towards red apple skin, bubblegum and earthiness. Aftertaste is very much red apple. M: Light on the tongue. Carbonation sits on the palate and scrubs for several seconds before diffusing into a slight astringency. Dry finish. O: At ten bucks a bomber I could buy this all day. And I probably will. This was to be my last attempt for funk. I'm not sure where this fits on the spectrum, but if this is what brett tastes like, I'm going to have to find more funky beers. A - My bottle had less head than some of the reviews, but still a good two fingers in my tulip glass. Typical bright saison color - cloudy. S - Horse blanket, barn yard, hay field - all the typical adjectives apply, but it smells good! T & M - I'm not a brett expert, but I like Belgian yeasty beers because the yeast adds an interesting dynamic. This seems similar. This is a creamy beer, but the spices and funky brett blend well. D - I want more.. It feels like less ABV than it is - light taste and highly drinkable. Update - as I've gotten more in to funky beers, I've really started to see that this one is world class. I've updated my ratings accordingly. Saison-Brett from Boulevard Brewing Co.